MANILA, Philippines - The annual Black Nazarene procession known as Traslacion happens today, January 9, 2018. 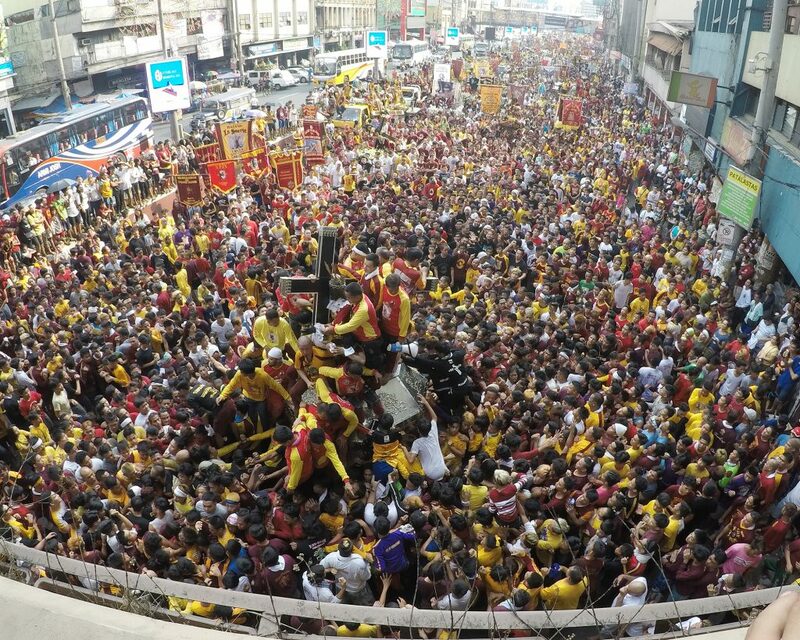 Up to 19 million devotees are expected to flock for the parade of the life-sized, dark wooden statue of Jesus Christ, from from Quirino Grandstand to Quiapo Church. The official Facebook page of the Quiapo Church (www.facebook.com/quiapochurch) and TV Maria (www.facebook.com/tvmariaphils) bring the livestream feed of the overnight vigil on January 8 to 9 and the 'Traslacion 2018' early Tuesday. Note: Once available, live stream video from major news organizations ABS-CBN News, GMA News and TV5 will be embedded here. Meanwhile, the government said "it’s all systems go" for the procession. Minor changes were made in the procession route specifically in the earlier part. From Quirino Grandstand (Independence Road), the procession will turn right to Katigbak Drive then straight to P. Burgos (westbound lane) going to P. Burgos (southbound lane) through Jones Bridge. The procession will then turn right to Dasmariñas, turn right again towards Plaza Santa Cruz, turn left to Palanca St., turn left to Quezon Blvd, turn right to Arlegui St., turn right to Fraternal St., turn right to Vergara St., turn left to Duque de Alba, turn left to Castillejos St., turn left to Farnecio St., turn right to Arlegui St., turn left to Nepomuceno St. (counter-flow), turn left to Aguila St., turn right to Carcer St., turn right to Hidalgo through Plaza del Carmen, turn left to Bilibid Viejo St. through Puyat, turn left to Guzman St., turn right to Hidalgo St., turn left to Bautista St. (Barbosa), turn right to Globo de Oro through under Quezon Bridge, turn right to Palanca St., then turn right to Villalobos St. through Plaza Miranda going to Quiapo Church. Manila Mayor Joseph Estrada cancelled all classes in all levels as well as work in the city government. The cancellation of work does not cover government offices involved in the maintenance of peace and order, traffic enforcement, disaster risk reduction and management, health and sanitation and issuance of business permits and collective taxes. In a radio report by DzBB, Superintendent Erwin Magarejo, MPD spokesperson, said that 5,000 Manila cops will be deployed for Traslacion 2018. Meanwhile, telecommunications compnies Globe and Smart will shut down their signal during the procession as a precautionary move approved by the National Telecommunications Commission and as recommended by the Philippine National Police. The annual celebration of the Feast of the Black Nazarene’s arrival in Quiapo church is a partnership of the Church with government and various NGOs. This collaborative effort is crucial in ensuring a peaceful and meaningful observance of the feast for the majority of the faithful and the devotees as well.